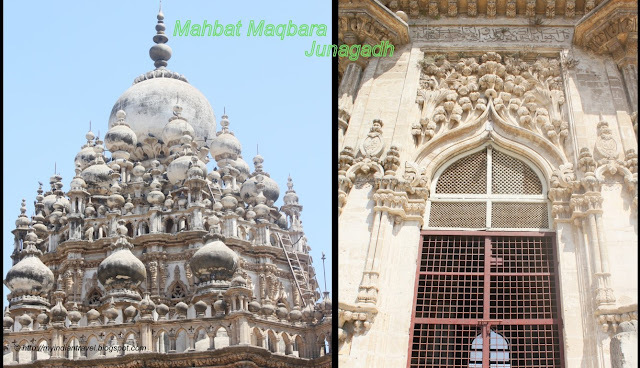 Nawab Mahbat Khan controlled the city of Junagadh from 1851 to 1852. In the year 1892 over his grave a tomb is built architecture of which is exquisite. The tomb is known by the Mahbat Maqbara. The architecture is a mix of Hindu, Islamic and European. Its striking appearance makes it one of the city's most important historical landmarks. Notable European features are the floor-to-lintel French windows and Gothic columns alongside the doors and windows. Sadly, today this historic monument is in a neglected state and surely deserves better attention for one of the unique architecture it showcases. Awesome designing. It's a unique piece of art itself. India is a "jewel of history" such a beautiful monument. Gujarat is a beautiful place to visit. Boa tarde, lindos monumentos com arquitectura que faz pensar na dificuldade na construção, os mesmos estão repletos de historia e encantam. WOW....I've never seen such beauty on a building. Just stunning. What a fantastic monument, it's sad that it's deteriorating. The architecture is beautiful, with its mixture of Eastern and Western styles. It is sad that it may be lost one day due to neglect. Pretty doesn't begin to describe this building. The architecture of this tomb is amazingly beautiful! I like the onion domes on the top--looks Byzantine. I hope that an organization will begin to do better maintenance of this structure so it is not lost. Very beautiful building and wonderful photography ~ thanks. That is incredible decoration! Thanks for sharing this. I am always fascinated by architecture that blends various cultural styles. Happy ABC Wednesday! It's a very impressive building. It would be a great shame when this magnificent building is going to fall into decay. Thanks for your excellent photos. I like how the different styles are layered. Beautiful architecture. Beautiful building How sad it's being neglected. Stunning architecture! It's a shame something so beautiful is being neglected. Marvelous structures. Sad to read about the neglect. Its always surprises me how they made so fine and complex designs...its always great to see such architectural works. Loved the pics a lot.